Worldwide, millions of people are treated each year for significant head injury. A substantial proportion die, and many more are disabled. If short term corticosteroid infusion could be reliably shown to reduce these risks by just a few percent then this might affect the treatment of a few hundred thousand patients a year, protecting thousands from death or long term disability. CRASH is a large simple, placebo-controlled trial of the effects of a 48-hour infusion of corticosteroids on death and on neurological disability, among adults with head injury and some impairment of consciousness. Head injured patients with impaired consciousness who are judged to be 16 years or older are eligible if the responsible doctor is, for any reason, substantially uncertain whether or not to use corticosteroids. Worldwide, some millions of people are treated each year for serious head injury, of whom close to a million die, and a similar number are disabled , often with profound effects on the subsequent quality of life of the affected individuals and their carers . If a treatment as simple as short term corticosteroids produces just a moderate benefit, this could be worthwhile. For example, if corticosteroids reduced the risk of death by just 2% (e.g. from 15% to 13%), and reduced the risk of permanent disability by a similar amount, then treatment of 500,000 patients would avoid 10,000 deaths and prevent 10,000 permanent disabilities. But, such a benefit would be impossible to demonstrate reliably without large scale randomised evidence. If, for example, 10,000 patients were randomly allocated to receive a corticosteroid infusion and 10,000 a placebo infusion, then a reduction from 15% to 13% dead should be detectable - and a reduction from 15% to 12% would certainly be detectable. By contrast, a trial involving only 2,000 patients would probably miss such differences. So far, all of the randomised trials of corticosteroids in head injury have been small: the largest included only a few hundred patients, and even in aggregate they have involved only about 2,000 patients (Table 1) . When all previous trials are combined, the risk of death in the corticosteroid treated group appears to be about 2% lower than in the control group, but the 95% confidence interval runs from 6% lower to 2% higher mortality. (This overall reduction from 39% dead to 37% dead corresponds to an 'odds ratio' of 0.91, with 95% confidence interval 0.74 to 1.12; the corresponding odds ratio for death or disability in those trials is 0.90, with 95% confidence interval 0.72 to 1.11.) Hence, the overall result from the previous trials is compatible with there being no real benefit, but it is also easily compatible with a benefit of a few percent. However, the existing trials are too small to demonstrate or to refute either possibility. Absolute benefit of steroids 2%, indicating 1 death prevented for every 50 patients treated: but these previous trial results are also statistically compatible with there being no real benefit at all (or even a small hazard). Recent evidence of benefit from corticosteroids in acute spinal cord injury has renewed interest in their possible role in brain injury. The Second US National Acute Spinal Cord Injury Study (NASCIS 2) compared 24 hours of methylprednisolone (MP) vs placebo in 333 patients with acute spinal cord injury . At six months, patients who had received steroids rather than placebo appeared to have greater improvement in motor function, and in sensation to pinprick and touch. Similar results were reported in a Japanese trial of the same regimen . Recent trials of MP in acute spinal cord injury have indicated slightly more neurological recovery with 48 than with 24 hours of treatment . the effects of such infusion on the risk of infection and of gastro-intestinal bleeding in this setting. CRASH is a large simple, placebo-controlled trial of the effects of a 48-hour infusion of corticosteroids on death and on neurological disability, among adults with head injury and some impairment of consciousness. Head injured patients with impaired consciousness who are judged to be 16 years or older are eligible if the responsible doctor is, for any reason, substantially uncertain whether or not to use corticosteroids. Numbered drug or placebo packs will be available in each participating Emergency Department. Randomisation involves calling a 24 hour free phone service. The call should last only a minute or two, and at the end of it the service will specify to the caller which numbered treatment pack to use. The drug or placebo in the pack is made up in saline and, following a one-hour loading dose, is infused over 48 hours (or as close to 48 hours as possible). No extra tests are required, but a short form must be completed 2 weeks later (or after prior death or discharge). Two main factors determine the number of patients needed in a trial. These are the estimated event rate, and the size of the treatment effect. Estimated event rate: In a recent multi-centre randomised trial in head injury using inclusion criteria similar to those in the CRASH trial, the overall risk of death among controls was 15%, with the risk of unfavourable outcome (dead, unfit for work or needing rehabilitation) being 43% . This trial is one of the most recent randomised trials of corticosteroids in head injury and it would be reasonable to expect a similar risk of unfavourable outcome in the CRASH trial. Size of treatment effect that should be detectable: Because even a 2% survival advantage for an intervention as simple and widely practicable as corticosteroids would represent a worthwhile benefit, the current trial has been planned to be able to detect a benefit of this size. Numbers needed: If the real mortality difference is 15% vs 13% then there is about a 65% chance that a trial involving 10,000 patients will achieve 2P <0.01, and a 95% chance that a trial involving 20,000 patients will do so. These calculations assess how well the trial is protected against an unfavourable play of chance. If however, as might well be the case, the actual results are not much distorted by the play of chance and involve 15% vs 13% mortality then a trial of 10,000 would yield 2P = 0.004, and a trial of 20,000 would yield 2P = 0.00004 (which is extreme enough to allow some exploratory sub-analyses of which types of patient seem most likely to benefit). 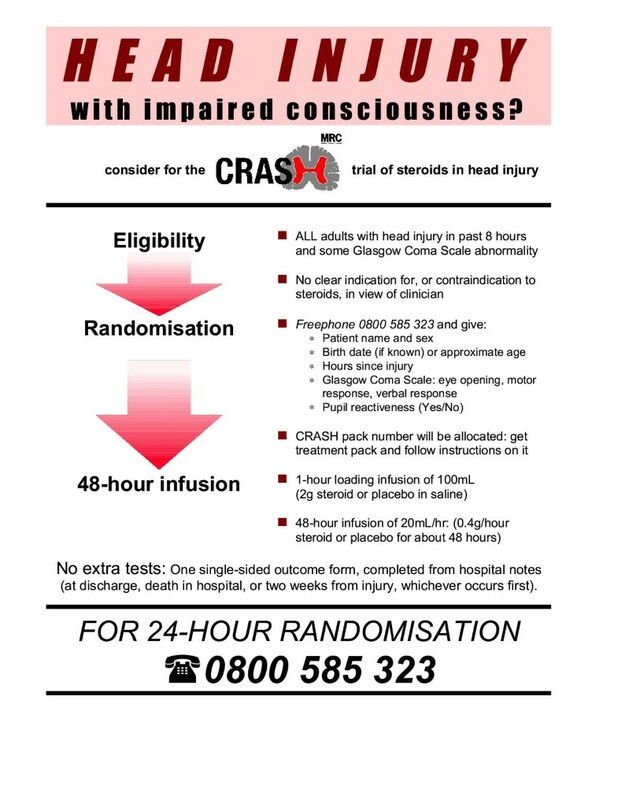 Head injured patients (judged to be 16 years or older) within 8 hours of injury who are not fully conscious (any abnormality on the Glasgow Coma Scale), except those for whom corticosteroids are thought to be clearly indicated or contra-indicated. All head injured patients who - in the absence of sedation - are observed whilst in hospital to have GCS of 14 or less, and are within 8 hours of the injury, are eligible for trial entry if they appear to be at least 16 years old. Although entry is allowed up to 8 hours from injury, the earlier that patients can be treated the better. 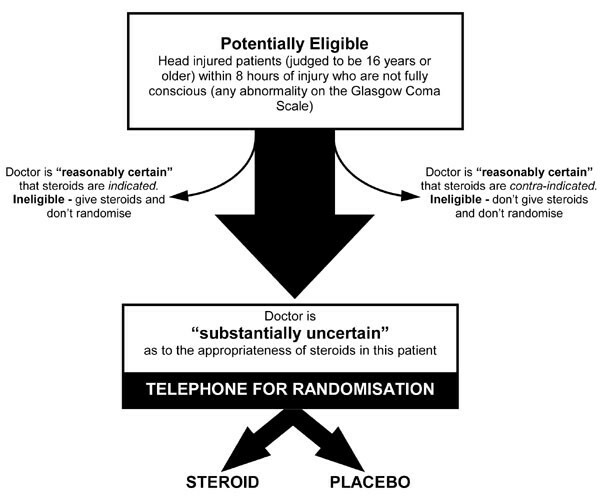 There are no other pre-specified exclusion criteria, as the fundamental eligibility criterion is the responsible doctor's "uncertainty" whether or not to use corticosteroids in a particular adult with head injury (Figure 1) . Patients for whom there is considered by the responsible doctor to be a clear indication for corticosteroids (such as, perhaps, those who also have an acute spinal cord injury) should not be randomised. Likewise, any for whom there is considered to be a clear contraindication to corticosteroids should not be randomised. But, all those for whom the responsible doctor is substantially uncertain as to whether or not to give corticosteroids are eligible for randomisation, and as many such patients as possible should be considered for the trial. Heterogeneity of the types of patients entering such a trial is a scientific strength, not a weakness. If a wide range of patients are randomised then it may be possible for a really big trial such as this one to help determine which (if any) particular types of patient are most likely to benefit from treatment. Special eligibility considerations: None. Routine exclusion of patients with gastrointestinal complaints or pregnancy is unnecessary, unless the responsible doctor considers these to be a definite contraindication. This short term corticosteroid regimen should not cause serious gastrointestinal bleeding, nor should it cause a large increase in infection. Although prolonged use of corticosteroids in pregnancy may affect fetal adrenocortical development, this short term treatment should not do so. Patients with head injury and impaired consciousness may be unable to give properly informed consent, and in this emergency situation it may not be medically appropriate to delay the start of treatment until proxy consent can be obtained. Hence, the doctor in charge should take responsibility for entering such patients, just as they would take responsibility for choosing other treatments. However, the requirements of the relevant ethics committee should be adhered to at all times. An information leaflet on the study for patients and their friends and relatives will be available in all drug packs. Patients eligible for inclusion should be randomised, and the study treatment started, as soon as possible. Randomisation is done by telephoning a 24-hour toll-free service and takes only about two minutes. The patient entry form (Figure 2) shows the questions that will be asked by the telephone operator prior to allocation of the treatment packs. The study computer will then randomly assign a treatment pack number that will identify one of the CRASH treatment packs stored in the emergency department. Once a patient has been randomised, we will definitely wish to learn the outcome in hospital, even if the trial treatment gets interrupted or is not actually given. N.B. As children under 16 are excluded, a simple fixed-dose treatment can be used. The dosing regimen is that used in the NASCIS-2 and NASCIS-3 trials of MP in acute spinal cord injury. Anaphylactic reactions to intravenous corticosteroids are extremely rare, but should be treated in whatever way the responsible doctor prefers (one possibility being intra-muscular adrenaline 0.5 mg, i.e. 0.5 mL of 1 in 1,000 (1 mg/mL) solution) . It would be expected that 24-hour anaesthetic cover would be available in all hospitals participating in CRASH. If a serious and unexpected adverse drug reaction occurs and is suspected to be related to the study medicine, this should be logged by calling the 24-hour randomisation service, who will inform the CRASH co-ordinating Centre in London. In general, gastro-intestinal bleeds and infections do not need to be reported in this way because some increase in their incidence might be expected with steroids. 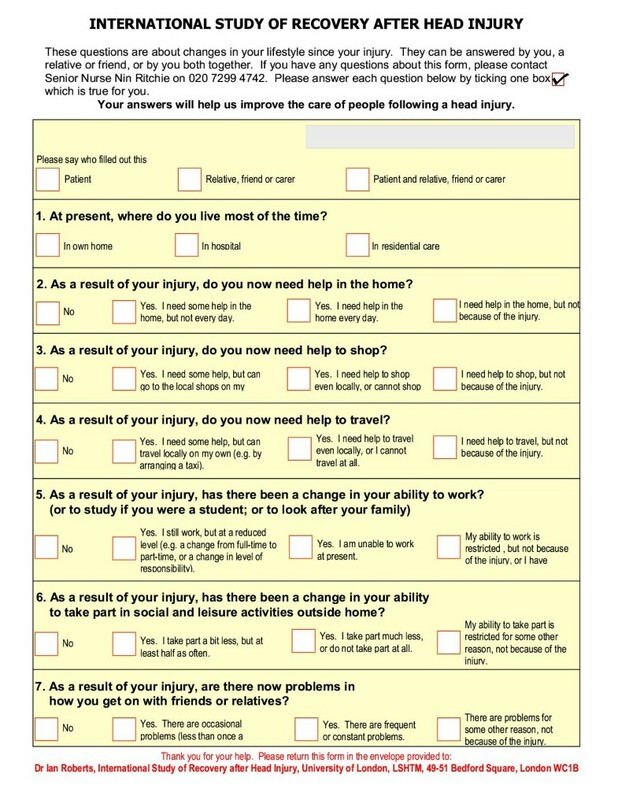 Likewise, the various medical events that are to be expected in head injured patients do not need to be reported by telephone. All such events are, however, routinely monitored among all patients on the outcome form. In general there should be no need to unblind the allocated treatment. If some contra-indication to corticosteroids develops after randomisation (e.g. severe gastro-intestinal bleeding), the trial treatment should simply be stopped. Unblinding was never found to be necessary in the NASCIS trial of MP in spinal cord injury , and should be done only in those rare cases when the doctor believes that clinical management depends importantly upon knowledge of whether the patient received corticosteroid or placebo (e.g. suspected anaphylaxis). 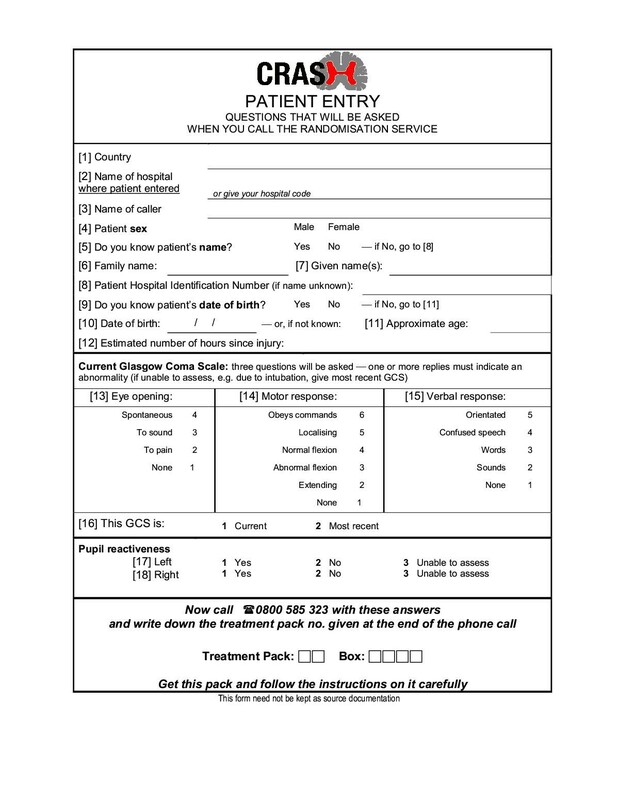 In those few cases when urgent unblinding is considered necessary, the randomisation service should be telephoned, giving the name of the doctor authorising unblinding and the CRASH treatment pack number (if available), and the caller will then be told whether the patient received corticosteroid or placebo. 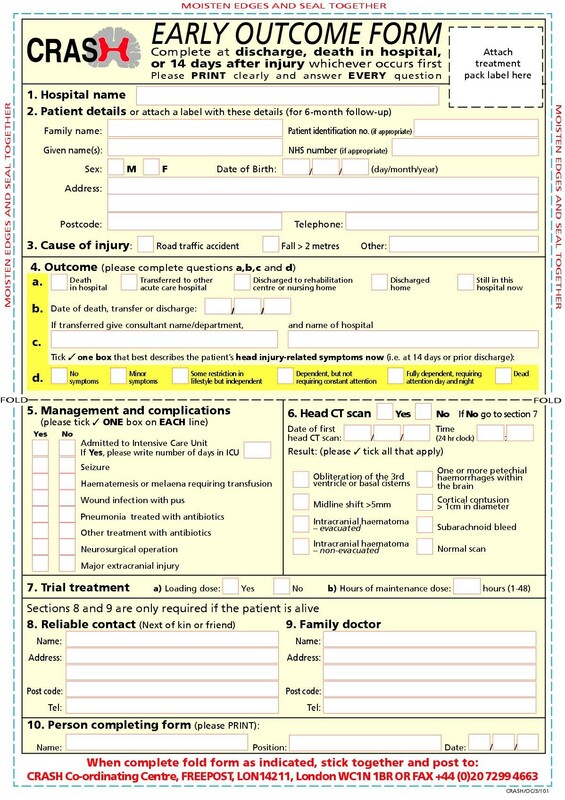 In-hospital deaths, complications and short-term recovery are to be recorded on the Early Outcome Form (Figure 3) which can be completed entirely from the hospital notes - no extra tests are needed. Comparisons will be made of the primary outcome measures, comparing all those allocated methylprednisolone versus all those allocated placebo, on an 'intention to treat' basis. Analyses will be stratified on time from injury to the initiation of treatment, and on severity of head injury as assessed by the Glasgow Coma Scale. Comparisons will also be made of the risks of infection and gastrointestinal bleeding. The independent Data Monitoring Committee will conduct interim analyses of mortality and morbidity among all trial participants. It will advise the Steering Group if the randomised comparisons in the trial provide both (i) proof beyond reasonable doubt of a difference in outcome between the study and control groups, and (ii) evidence that would be expected to alter substantially the choice of treatment for patients whose doctors are, in the light of the evidence from other randomised trials, substantially uncertain whether to give corticosteroids to patients with head injury . The success of CRASH will be entirely dependent upon the collaboration of nurses and doctors in the participating hospitals. Hence, the chief credit for the study will be assigned to them in the main publications, and the collaborators from each participating centre will be named personally in the main report. The CRASH trial is sponsored by the Medical Research Council (MRC) and not the manufacturers of methylprednisolone. The MRC fully accepts responsibility attached to its sponsorship of the trial, and as such, would give sympathetic consideration to claims for any non-negligent harm suffered by anyone as a result of participating in this trial. Medical Research Council funding covers meetings and central organisational costs only. Pharmacia Corporation are donating drug and placebo, but the design, management and finance of the study are entirely independent of them. Methylprednisolone is not a new product. Really large trials of such drugs, involving many hospitals, are important for future patients but are practicable only if those collaborating in them do so without payment (except for recompense of any minor local costs that may arise). The supplement shows the information leaflet for patients, relatives and friends, approved for use in the UK by the multi-centre research ethics committee. The protocol for the CRASH trial was prepared with input and advice from of a large number of individuals and organisations and is submitted on behalf of the management group of the CRASH trial.